This is a Washington DC area food blog. Here you'll find my original recipes, cookbook and restaurant reviews, travel and food photography. Look around, keep in touch, and come back soon! 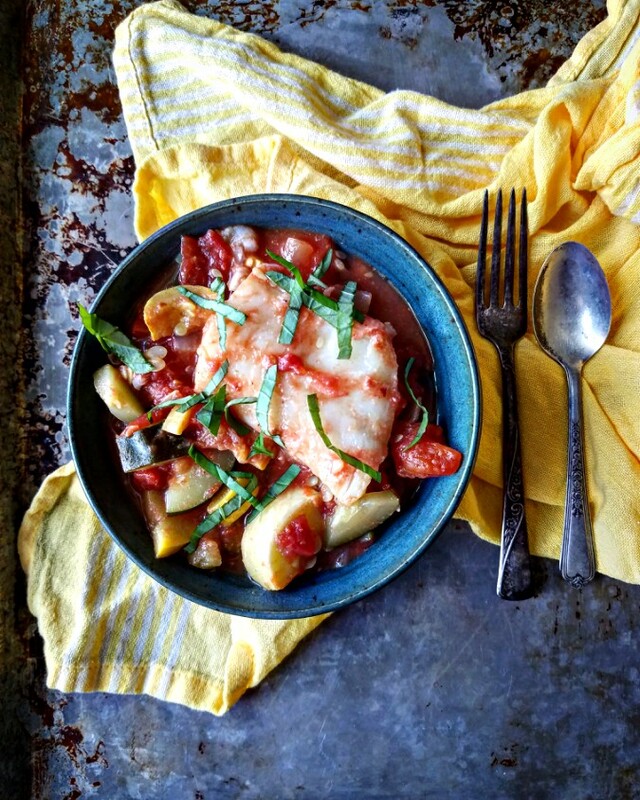 This Zucchini, Tomato & Cod Recipe is super quick, satisfying, healthy, and reheats well. I wasn't planning on blogging about it, but after tasting my creation, I wanted to share it with you. If you have had one too many burgers or hot dogs yesterday at the 4th of July get together, or are drowning in the number of zucchini from your garden, or don't eat meat on Fridays, or just want something that feels light, make this dish! 1. Heat the olive oil in a large skillet. Add zucchini, summer squash, onions, and garlic. Season with salt and pepper and saute until the vegetables are tender. 2. Add diced tomatoes and their juices and red pepper flakes and bring to a low simmer. 3. Submerge cod in the zucchini/summer squash/tomato stew and simmer, covered, until the fish is cooked through. This may take 5-15 minutes depending on the size of the fish: check the fish with a fork to make sure it is cooked through. 4. Serve topped with fresh basil. 1. I used defrosted cod. It worked really well. 2. You can use sliced peppers into the stew in step #1. 3. Olives or capers would be a great addition to this dish.